(Nanowerk News) Imagine that every time you tapped out a message on your smartphone, it would create electric power instead of sapping your phone’s battery. That scenario could one day be a reality, according to a researcher at Missouri University of Science and Technology. Writing in the February 2018 issue of the journal Nano Energy ("Metallic MXenes: A New Family of Materials for Flexible Triboelectric Nanogenerators"), Dr. Vadym Mochalin, associate professor of chemistry at Missouri S&T, describes how a new family of two-dimensional transition metal carbides, known as MXenes, could be used to harvest wasted frictional energy, for example, from muscle contractions during typing or walking. MXenes, discovered in 2011, comprise one of the largest families of two-dimensional materials. They possess high electrical conductivity and the ability to uptake electrons when in contact with polymers and other materials. This unusual combination of properties makes MXenes useful as components for triboelectric nanogenerators (TENG), which turn muscle movements into electric power. The research suggests these advanced materials could be incorporated into mobile phones, handheld electronics, wearable devices and laptops, ultimately making them self-powering. “Exploring new chemistries and fundamental physical properties of MXenes for applications in energy storage, biology and medicine, electronics, composites, sensors and water purification is a hot area in the two-dimensional materials field,” says Mochalin. The paper was written in collaboration with research groups from Drexel and Clemson universities. Another study from Mochalin and his collaborators, “Saturable Absorption in 2D Ti3C2 MXene Thin Films for Passive Photonic Diodes,” was published in Advanced Materials ("Saturable Absorption in 2D Ti3C2 MXene Thin Films for Passive Photonic Diodes"). This research shows how the non-linear optical properties of MXene – fullerene layered structures enable light rectification, a process similar to electrical current rectification which has been in use in electronics for decades. 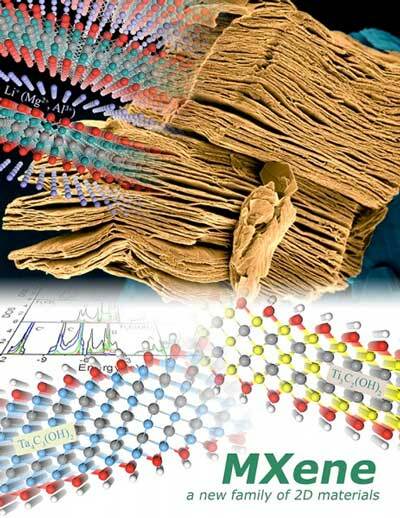 When compared to other two-dimensional materials, such as graphene, MXene is superior in its mechanical stability, conductivity and light radiation damage resistance, the researchers write. A technique developed by Mochalin’s research group to deposit the nearly transparent and conductive MXene films on glass and other substrates may be used to fabricate passive saturable absorbers for generation of nanosecond pulses of high energy and peak power with solid-state bulk lasers. The high-energy ultrafast laser pulses are beneficial for processing materials where thermal influence must be minimized, for example, in drilling and cutting metals, delicate semiconductor wafers, polymeric stents, glasses, and other materials. These MXene films — only tens of nanometers in thickness — are also ideal for a wide range of applications in photonics, photovoltaics, flexible electronics, environment- and photo-sensitive sensors, and many others. Working with international scholars, Mochalin’s research group at Missouri S&T leads the studies on the synthesis, characterization, computational modeling, and development of novel nanomaterials, like MXenes and nanodiamonds, for energy storage systems, composites, and biomedical applications. Mochalin involves Missouri S&T chemistry students in research — from highly-motivated undergraduates, to post-doctoral researchers. He has obtained six patents for discoveries in the fields of nanodiamonds, biodegradable composite materials, and energy storage.